Fourth of July is right around the corner, and I thought I would share with you all something fun! One thing I love about the fourth is how I remember it was soo much fun as a kid. As I’m grown up now, I like to watch my nephews and nieces enjoy themselves! And when you want kids to enjoy themselves, you give them something to enjoy! So I made up these kid goodie bags and I think they’re pretty cool, if I do say so myself. They also could be for any age! First off, these are such cute headbands. I think they’re sweet to watch the kiddos wear! Any patriotic headband would be cute! This chalk is so adorbs. And a good way to keep kids busy while cooking would be to give ’em some chalk and go to town! These are the cutest thing ever! Just like glow sticks but they last longer and the kids really enjoy them! Also, easy to keep track of the kids when they’re playing in the dark! If you have a younger kiddo, this book is wonderful for the holiday! It’s so cute and sweet! This gift was specifically picked out for my niece that loves Minnie! And it’s patriotic so it was perfect! You obviously need a bag to put these goodies in and here are some sweet, inexpensive ways to give the gifts! Sunnies are such a good idea for the kids! They’re useful for summertime in general and such a good piece for the fourth! This isn’t necessarily a “goody” for the kiddos but it’s something cute that will help the kids but help decorate the baggies! That’s all friends! I hope you like this post. 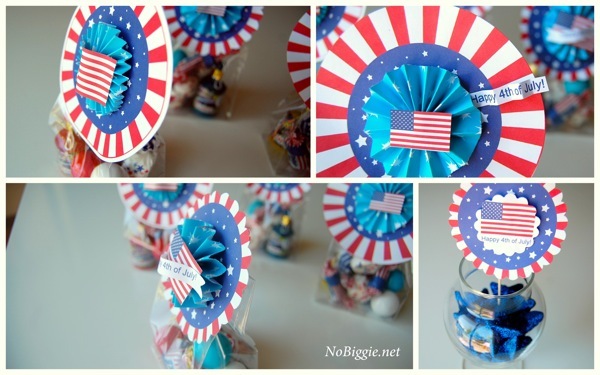 I love the idea of spoiling kiddos with patriotic goodies.